We stretched our unbeaten run to four games with what in the words of one of our former managers could be deemed as a winning draw. This season The Rams seem to have been rebranded in the media as “Frank Lampard’s Derby County” but apart from a 15-minute period before half-time it was Alex Neil’s Preston North End who took the plaudits after totally dominating the evening’s proceedings, particularly in the second half. We had not recorded a home victory against Derby since Boxing Day 2008, and the Rams had won on their last four visits here but this jinx would have been broken but for some excellent defensive blocks in the penalty area by our visitors, when it seemed inevitable at one point that our attacking play would lead to a goal. Our best chance during a second-half onslaught came inside the last 10 minutes when our record signing Brad Potts burst through on goal but unfortunately he was unable to get a firm shot in and the grateful keeper gathered his scuffed effort. 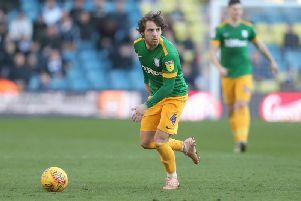 It was disappointing to see Ben Pearson pick up another harsh booking for a hardly robust tackle which barely tickled the ankles of the seemingly poleaxed opponent. I feel that the yellow card was more due to his past reputation, coupled with the animated touchline gesticulations of the Derby ex-England international manager and the reactions of their fans, who tried to get our influential player sent off in order to give them a better chance of winning the game – a disturbing tactical ploy which we are seeing more and more in the modern game. Man of the match Ben Davies is a player I think with the potential to one day make the England squad and he reminded me of a young Mark Lawrenson, turning in another accomplished performance while marking ex-fans’ favourite David Nugent, who wasn’t really noticed until he received warm applause from both sets of fans when substituted .